Over the last couple of years, the number of mobile health applications have doubled, with hundreds of thousands of such apps available today. The digital health market is anticipated to exceed $379 billion by 2024, and a large chunk of that market size is attributable to increased use of mobile communications technology and devices by consumers and health care professionals. Until recently, there has been little guidance in terms of mobile health security frameworks. However, last month, the National Cybersecurity Center of Excellence at the National Institute of Standards and Technology published a cybersecurity guide for electronic health record applications on mobile devices. The 260-page guide is an important step to making mHealth apps more secure, especially considering hackers tend to target mHealth apps. Regulators and companies will need to prioritize mHealth security to ensure health care professionals and consumers can benefit from the new technology without fear of jeopardizing consumer privacy. GDPR and blockchain do not coexist easily. GDPR attempts to ensure that personal data is retained for as short a period as possible, give individuals control over their personal data, and allow easy modification, correction, or erasure at any time at the individual's request. Blockchain is intended to serve as an immutable ledger, where transactions cannot be repudiated, and records cannot be changed by anyone. Public or permissionless blockchains are operated under rigid rules that may not be compatible with GDPR. Private or permissioned blockchains, which can establish rules of operation, have more flexibility and may have a better chance of being in line with GDPR. On July 25, 2018, a unanimous three-judge panel at the United States Court of Appeals for the Federal Circuit issued a potentially far-reaching opinion on the application of enablement under 35 U.S.C. § 112, ¶ 1. The case at issue, Trustees of Boston University v. Everlight Electronics Co., involved Boston University’s patent infringement allegations relating to a semiconductor device. There was no question that the asserted claim had enablement support for five out of six permutations that fell within the scope of the claim. The jury heard testimony, however, that the sixth permutation was not supported by the specification. Nevertheless, the jury rendered a verdict in favor of the patentee finding the patent valid and willfully infringed. In a previous GT Alert, we summarized and analyzed the Supreme Court’s June 21, 2018, decision in Lucia v. Securities & Exchange Commission, 138 S. Ct. 2044 (2018). That GT Alert cited the SEC’s 30-day stay of “all administrative proceedings” “before an administrative law judge” and foretold continued uncertainty concerning the status of administrative law judges and their decisions. A subsequent 30-day stay was issued on July 20, 2018, and expired on Aug. 22, 2018. On that date, the SEC issued an order entitled In re: Pending Administrative Proceedings (the Order), summarizing the SEC’s position on, and reaction to, the Lucia decision. The Order is clear in at least one respect. In response to the Supreme Court’s holding that complaining litigants are entitled to “a new ‘hearing before a properly appointed’ official,” the Order provides for “the opportunity for a new hearing before an ALJ who did not previously participate” in a pending proceeding. The SEC will provide such an opportunity through a “remand [of] all proceedings” and will “vacate any prior opinion” issued in these matters. In an exhibit to the Order, the SEC listed 126 proceedings that may be subject to remand. The next day, the SEC’s Chief ALJ issued a subsequent notice identifying an additional 68 currently-pending cases for remand. On Friday, Oct. 19, the United States Department of the Treasury released (i) proposed regulations related to investment in Qualified Opportunity Zones and Qualified Opportunity Funds and (ii) Revenue Ruling 2018-29 related to the treatment of land under the program. The issuance of this highly anticipated regulation and guidance will be critical to investors, Qualified Opportunity Fund managers, and project sponsors involved in real estate, venture capital, operating business, and project finance in Qualified Opportunity Zones. We have been working extensively with clients with this new tax incentive and will be releasing analysis and webinars in the near future describing the impact of these new regulations and Revenue Ruling. The right of privacy has been described as “independent of the common rights of property, contract, reputation and physical integrity, . . . the right to live one's life in seclusion, without being subjected to unwarranted and undesired publicity. In short it is the right to be let alone.” Since the “right to be let alone” can be violated in contexts immensely diverse in consequences and degree, the common law which recognized the right did not easily lend itself to analysis. It is well settled that the right of privacy is a personal one and cannot be asserted by anyone other than the person whose privacy has been invaded. That is, a plaintiff must plead and prove that his or her privacy has been invaded, and the right does not survive, but dies with the person. California’s common law invasion of privacy tort encompasses four distinct types of activities: “(1) intrusion into private matters; (2) public disclosure of private facts; (3) publicity placing a person in a false light; and (4) misappropriation of a person’s name or likeness.” Most relevant to this treatise are claims for intrusion into private matters and misappropriation of a person’s name or likeness. Notably, a publication must contain some direct reference to the plaintiff. No recovery can be had where the publication at issue is directed at another individual and only incidentally refers to the plaintiff. Additionally, a plaintiff may not recover where the only relation to the asserted wrong is as a relative of the victim of the wrongdoer. Read more: "Privacy Law and California's Antitrust Laws." California State Antitrust & Unfair Competition Law. Matthew Bender 2018. In Martinez v. Landry Restaurants Inc., a California state appeals court has held that, in the absence of a federal stay, the time period during which a federal appeal from an order remanding a case to state court is pending should be included when state trial courts calculate the “five-year rule” for bringing a case to trial. This ruling means that, in lengthy complex civil cases and class actions, both plaintiff and defense counsel should carefully consider whether to seek a stay of proceedings where the case crosses jurisdictional boundaries. “Be more social!” Twenty-five years ago, this was probably something your parents said to you to get you up and out of the house. However, the phrase likely has a whole new meaning in 2018. Now, it likely means get more active on one or more of the seemingly ubiquitous internet social media platforms like Twitter, Facebook, Instagram, or Snapchat. And as the world-at-large gets more “social,” companies understand they must get social as well to connect with their target audiences. 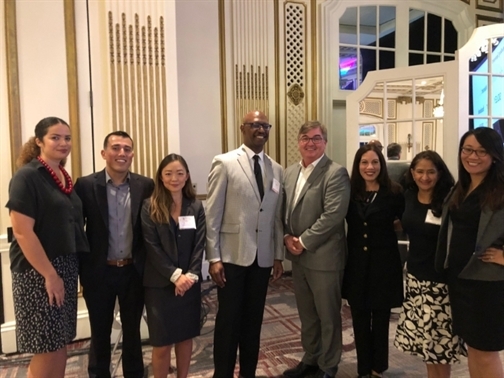 Greenberg Traurig was honored as a finalist for the Drucilla Stender Ramey Majority-Owned Law Firm award by California Minority Counsel Program (CMPC), a nonprofit dedicated to promoting diversity in the legal field by providing attorneys of color with opportunity and access for professional and business development. The firm was recognized at the CMCP’s 29th Annual Business Conference, held Oct. 10-12 in San Francisco (pictured below). Jeff E. Scott, co-chair of the Global Litigation Practice and co-managing shareholder of the Los Angeles office at global law firm Greenberg Traurig, LLP, was named the “2018 Litigation Attorney of the Year” by the Los Angeles Business Journal (LABJ). Adam Siegler was interviewed by Law360 On Legal Aid For Veterans. Greenberg Traurig this year launched an initiative designed to augment the work we’ve been doing on behalf of veterans with local and national organizations. Nina D. Boyajian was listed in Global Data Review's “40 Under 40 2018” and was profiled by the publication. The list recognizes individuals around the world representing the best of the upcoming generation of data lawyers. Greenberg Traurig was recognized for its Mergers & Acquisitions Practice in the Southern California region in the 2018 edition of IFLR1000 United States, a guide to the leading financial and corporate law firms. Mark D. Kemple and Ashley M. Farrell Pickett were mentioned in a Law360 article titled "KFC Wage Suit Kept Out Of State Court For Now By 9th Circ." Click here to read the full article (subscription). Barbara A. Jones was named a "2018 Cryptocurrency, Blockchain, and FinTech Trailblazer" by The National Law Journal and featured in a profile by the publication. Charles S. Birenbaum was named among the Nation’s 100 Most Powerful Employment Attorneys by Lawdragon’s Human Resource Executive. Daily Journal featured an event hosted by Greenberg Traurig’s Orange County Women’s Initiative, “Disrupting Implicit Bias,” which brought together prominent women leaders from all sectors of Orange County’s business, legal, and academic communities. Featured in the article were GT’s Hilarie Bass, Susan L. Heller, Irene Pyun Kim, Mary-Olga Lovett, Patricia Menéndez-Cambó, and Sophia J. Shin, and L. Song Richardson, dean of the University of California, Irvine School of Law. Susan L. Heller was listed as a 2019 “Lawyer of the Year” for Trademark Law by Best Lawyers. Heller was also recognized as the Most Influential Woman in Trademark Law 2018 for California by Acquisition International. Candice E. Kim and Matthew Gershman were mentioned in a Law360 article titled "TTAB Refuses 'Phone Tracker Pro' TM, Citing TracFone App" in connection with their representation of TracFone Wireless Inc. To read the article, click here. (subscription). Daily Journal featured Greenberg Traurig’s representation of AGR Partners, LLC in its investment into Vintage Wine Estates, a privately-held wine company based in Santa Rosa that produces and markets wines and spirits through a portfolio of exclusive brands. AGR was represented by Shareholder Marc. R. Baluda, Of Counsel Gregory H. Cooper, and Associate Jane Kim in the transaction.